In recent years, there is a priest that I have followed a bit. His name is Fr. Tommy Lane. He came from Ireland and he became a professor and a successful preacher at Mount Saint Mary’s Seminary in Emmitsburg, Maryland. I was reading some of his words recently and I noticed how Fr. Lane reminded us of the similarities between the Holy Family and our ordinary, everyday families. For example, we have friends who had thirteen children. Early in their family life, they took a long trip and left one of their offspring at a turnpike rest stop. Did you ever lose one of your children when you were on a trip, or even lose a child who was playing outside of your home? Only then to find them and sweep them up into your arms asking, as Mary did: ‘Why have you done this to us?’ The lost one in your own arms might try to make up a reason why he or she wandered off… it may seem unclear what they are saying. And Mary and Joseph didn’t really understand the answer that Jesus gave them about being about His Father’s affairs. Fr. Lane said that the Holy Family was a family that (most surely) had signal and special graces — but they were a most ordinary family having trials and travels and geographic moves forced upon them. Sometimes there are broken bones or other serious illness or challenges. Just in these recent hours, the Gospel at Mass narrated the words of Simeon telling Mary she would have her heart pierced with a sword of great sorrow. Of course Mary came to know the answer. But not right away; and so too, all of us in our family troubles. Why unpleasant or painful things happen may remain fully in the providence of Almighty God, but, as with the Holy Family, there is no answer but faith and we are called to continue our Catholic journey just as The Holy Family persevered. To encourage families today I want to share words from Blessed John Paul II. On the day he left Ireland in 1979, much of his homily in Limerick was for the purpose of giving encouragement to families, and in particular to parents. The Pope reminded that the family is primary. Family has been our greatest resource. And due to relativism and divorce and the attack on the true meaning of marriage, the current challenges make family more important than ever. The Holy Father said that the idea of a close-knit family isn’t outdated. He asked that we not follow the trends that are creating difficulties for family life and Christian marriage. John Paul said that we should revere and protect family and family life. He said the Christian family is more important for the Church and for society today than ever before. He reflected on the importance of parents to remain good fathers and mothers, and this is true as well for grandparents and great grandparents. Do not think that anything you will do in life is more important than to be a good Christian father and mother. The Holy Father also reminded that day that marriage means being open to the receive the gift of children from God. Do we not see how much society and the media and the contraceptive mentality have damaged marriage and parenthood since the 1970’s when John Paul spoke these words? As the Pope left Ireland, he asked families to give him a parting gift. Imagine JPII asking them for a gift. He asked us that our homes would always be places of prayer. As we ended the year with the feast of the Holy Family, I ask you to look at your home with the eye of the late John Paul II. Are there signs of prayer and holiness around you? Are there holy pictures and statues? Is there holy water? Does your family pause to include grace before meals? The Holy Family did this. It is this example that faithful followers of God’s loving gifts are called to emulate. I have shared with you before that when I was completing four years of deacon seminary classes, they had us go on a one week silent retreat. It was a discernment retreat to seek God’s voice about whether to accept the call from the Church about ordination. As I walked on a path by myself… as I wondered if I should move forward, I discovered myself praying: “Jesus, Mary and Joseph, I trust in you.” When I realized what I was doing — resistance was futile and unnecessary. The rest is history. In closing, let me share that we were given a gift to hear of David and Allyson about six or more years ago. It was back in those days that we came to know of a Catholic Family who was proud of their faith and their family. Four or five years ago, the Sweeneys invited Deacon Tom to act as a sort of ‘chaplain’ for the Catholic Family website. What an honor. 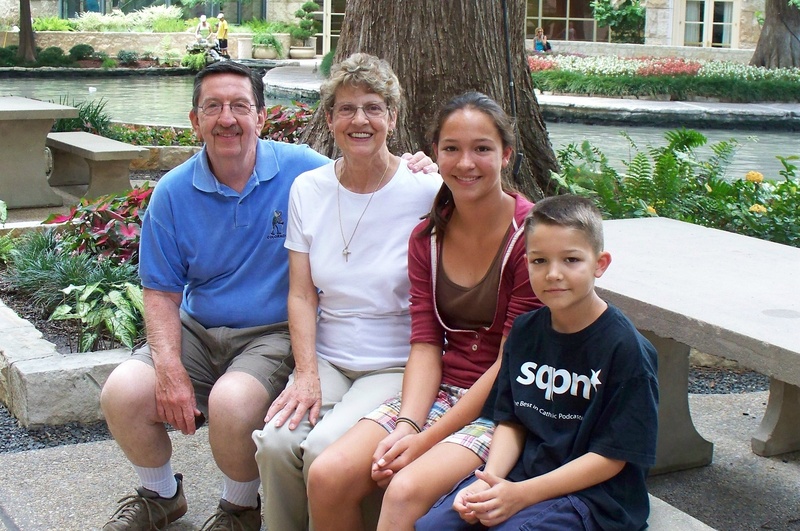 Two years ago, Dee and I were especially gifted to be invited to visit The Catholic Family in their Texas home. What we envisioned from a distance through the lens of their podcast turned out to be quite true in their home. Ordinary folks with eternal goals. Ordinary kids who love and who care; ordinary kids who bicker and test the boundaries (and even one who cuts her hair [on one side] with scissors picked up when no one was paying attention). And evening time complete with the rosary, said as a family. We aren’t ‘family’ to The Catholic Family. But we sure do care for them as if they were members of our family. 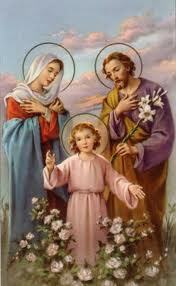 Holy Family — pray for us. Amen.